Treasure, tricks or trouble-is this your lucky night? ATMOSFEAR KHUFU THE MUMMY is an amplified experiance in home entertainment. 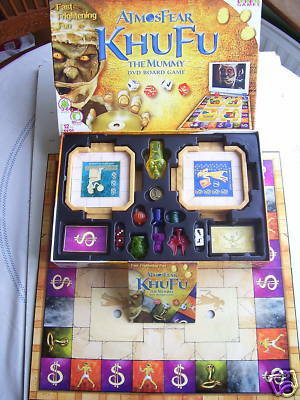 With its unique combination of board game and interactive DVD, this game of chance and skill is A RACE AGAINST TIME. Once you press ply you have only 45 minutes to lay down all your scarabs then take on the great pharaoh himself in KHUFU'S ULTIMATE CHALLENGE! So come on in and match wits with your host, the fiendish pharaoh KHUFU. He really wants you to win!